Not A Joke: Restaurant, Concert Hall, Conference Center Inside World's Largest Moose | OhGizmo! Oh, and for all of our Swedish readers (? ), this is an elk to you guys, but it’s the same animal: alces alces. 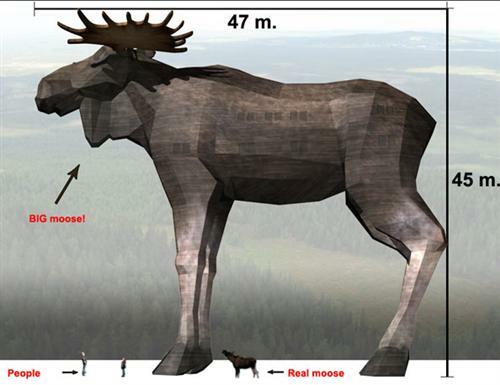 Construction should begin before the end of this year, and the total cost of the moose is predicted to be about $6.5 million. On the news that his project has finally been approved after three years, the creator of the moose, Thorbjörn Holmlund, says: “This is such unbelievably good news. My whole body is shaking with joy. People have really wanted to make this happen. There have been plenty of days when I have come close to crying but today I can do nothing but laugh.” Me too, buddy. Me too. Certainly tops Albert the Bull. But will it be anatomically correct too? – Has anybody seen the exit!? Better not let the Gorillaz near it… Murdoc might blow it up with a giant missile!